AntiVirus applications and other security software are integrated into the system deeply, so while uninstalling some of these programs may leave files behind. It is nearly impossible for the average user to hunt these files and remove all the files. There are some uninstall applications like Revo Unistaller that are good at uninstalling applications effectively. AppRemover is a free program that will remove popular security applications with ease. Run the application it will scan your system and displays the list of applications installed. 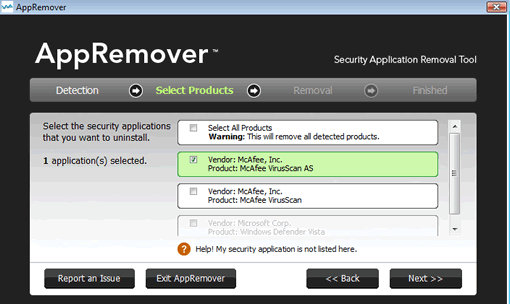 Select the one you want to uninstall to remove from your computer. Uninstalling AntiVirus or security applications is not a good idea, but when you want to change the program you are using or if there are any conflicts between already running programs you want to uninstall them. Appremover is a freeware and standalone program. It works with Windows 2000, 2003, XP (32 / 64 bit), Vista (32 / 64 bit), 2008, Windows 7 beta. It supports a long list of security applications including popular Vendors like Symantec, Trend Micro, Panda, PC Tools, McAfee, Lavasoft, Kaspersky, F-Secure, CA, Avira, AVG among others.